Not everyone blogs full time. 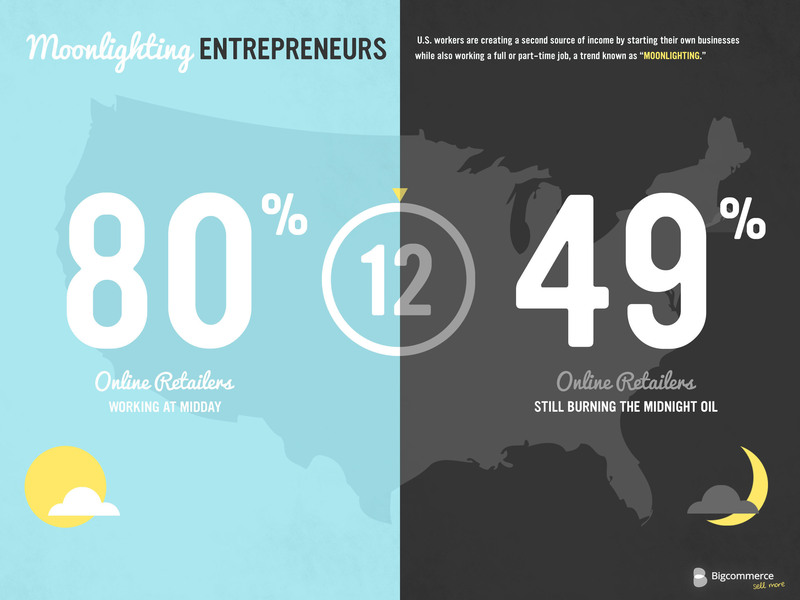 In fact, a growing number of Americans are “moonlighting” or starting their own online businesses while employed elsewhere according to analysis by Bigcommerce.com, an e-commerce platform. The analysis didn’t look at blogging specifically but did look at so-called indie online retailers during a three-month period earlier this year. What they discovered was that nearly a third of all the activity logged by these retailers occurred between 6 p.m. and 8 a.m. and a surprising amount too place after midnight. Obviously, many retailers are working outside regular business hours. What does that mean for bloggers? Bigcommerce doesn’t say but we can extrapolate some ideas from their data. Notably, if your audience is small business people or small businesses themselves, you may be better off becoming a night owl. It also means that if you are a moonlighting blogger, you might want to look a little closer at your daytime co-workers. They could very easily be potential clients with money to spend and a serious need for quality content. If you’re a local blogger living in the South, consider yourself lucky. The largest group of moonlighting entrepreneurs (33 percent) calls your region home. Local bloggers in Florida, Georgia and Texas should also be counting their blessings since these states have the highest concentration of moonlighters. On the other hand, Midwesterners are going to have to work a little harder to find moonlighters, since only 15 percent of those moonlighting live and work in that part of the country. Not a night owl? Fortunately, there are a number of tools that can help you get in front of moonlighting entrepreneurs and keep you and your blog top of mind. From scheduling publication, updates and social media to having “local” phone numbers in multiple regions, it is possible for bloggers to work whatever hours are most creative for them and still reach this audience.